I love sharing what God is doing through SOCPM. Catch me in a coffee shop or any fellowship gathering and ask me to share, and I can share for too long. However, when it comes to sharing through The Barbed Wire Newsletter, I fail miserably. I can point to my poor writing skills—having to put all that is happening in a creative article without becoming too wordy—as the reason why, but nonetheless, I’ve failed those who are readers and especially those who support the ministry. I apologize for my lack of sharing on a consistent and regular basis and humbly ask for grace. I am open to volunteers who can help me produce The Barbed Wire or help in other areas. See the end of the newsletter for more information. Before SOCPM entered the classroom, its primary area of serving was cell-by-cell visits in Pontiac Correctional Center with Prison Fellowship. It was a good experience to learn aspects of prison culture—for one, despite confinement to a cell 23 hours a day, freedom was not always a joyful expectation. I recall Gino who was soon to be released, but he feared his addiction would be awaiting him once he walked into freedom. After praying with Gino, he returned to his bed, buried his face in a towel, and wept. 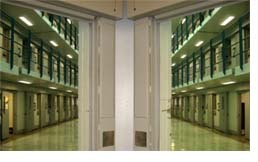 Once after sharing the Gospel, an inmate confessed Christ as Lord and Savior, then God asked me, “Who will disciple him? Without discipleship, his professed faith will be snatched away by the evil which engulfs the prison and he will fall away.” It was that day God planted the seed of SOCPM's mission and vision for ongoing discipleship in God's Word and Christian living. It’s humbling to see how God has matured me to be a father figure and a teacher of His Word in the lives of men. However, my heart grieves when I recall the days of Pontiac—the isolation and loneliness the prisoners shared, hearts void of hope and love. This past spring and summer, discipleship students completed Ligonier Ministries' “Defending Your Faith” (DYF) series. The 32 lessons took two SOCPM class sessions. DYF Part 1 had 57 students receive certificates and DYF Part 2 had 68 students. In order for both SOCPM classes (Discipleship and Christian Living) to end on the same week, SOCPM implemented “Bonus Programming” (BP), when at the conclusion of the course's certificate curriculum, students watched various teachings. At the end of DYF Part 1, the BP consisted of Greg Koukl's 6-part Tactics: A Game Plan for Discussing Your Christian Convictions and Is Genesis History? with Del Tackett. The students were also blessed by Christian Focus Publications, who donated copies of If There’s a God, Why Are There Atheists? by R.C. Sproul. At the conclusion of DYF Part 2, the BP included Creation Ministries International’s Evolution’s Achilles’ Heels and several videos from Living Waters: Genius, Noah, The Atheist Delusion, and Evolution Vs. God. The Living Waters on-the-street interviews brought laughter but interesting discussion. A final BP was “Why Does God Allow So Much Suffering and Evil?” with John MacArthur at the Ligonier Ministries 2008 West Coast Conference. SOCPM students once again were blessed with books, as Zondervan donated copies of Tactics: A Game Plan for Discussing Your Christian Convictions by Greg Koukl. My prayer is that the next edition of The Barbed Wire will come in January. But I need your prayers and your help. God is constantly giving me visions of the next step but it is more than one person can bring about. A key area I need help with is increasing awareness of the mission and vision of SOCPM. I’m not gifted in social media and content management, including the SOCPM website and The Barbed Wire. If you are gifted in marketing or promoting (I’m not even certain what all the areas are), PLEASE pray if God may be asking you to help. Contact me at info@socpm.org.